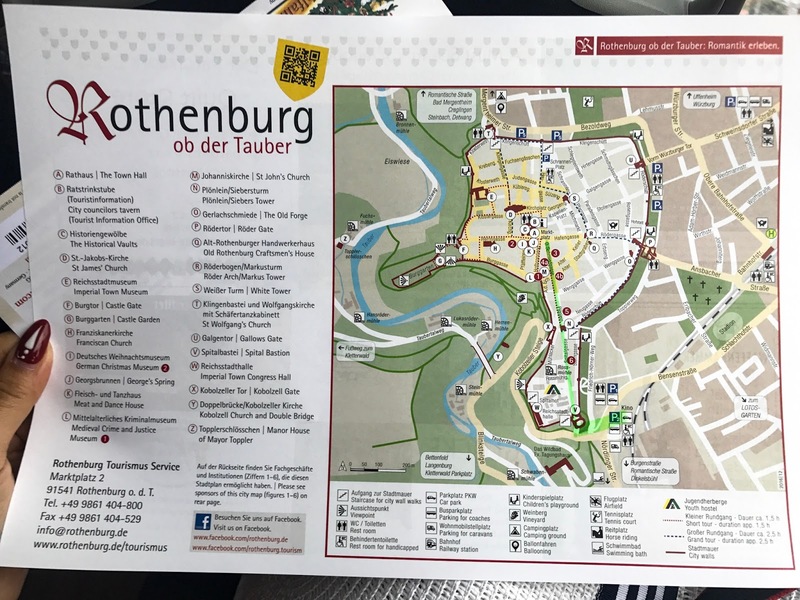 After an amazing Saturday at Neuschwanstein castle, we were headed off to the medieval town of Rothenburg ob der Tauber. It was almost pouring rain in the morning so I was pretty worried about the day. The meeting spot was just outside of Karlsplaz Shopping Center. We hopped on a big tour bus with a group of probably around 50 people. There were people from everywhere, but in general we didn't really interact with each other. The tour lady was this middle aged German lady who had a very hypnotizing voice, or maybe I was tired but it was difficult to stay awake and listen to her. We drove out of the city, and onto the Autobahn first!! Here we go!!!!! No speed limit!!! This is unusually exciting in a very silly way, though I'm not driving, the thought of being on the Autobahn is pretty amazing. After a bit on the Autobahn, we got off and drove on the slower country side roads of northern Bavaria. It was a really lovely drive, similar to the train ride yesterday, with picturesque sceneries of nature. The rain had also stopped which is quite nice as we'll be outdoors for the most part after we get off the bus. 2 hours later, we arrived at Harburg. This is an old Medieval town, with a castle that dates back to the 1,150s. It was never seriously damaged in war, not even during World War II. Inside the castle, you see a nice courtyard in the middle with a well. The castle tour guide takes us in from a very small entrance downstairs. We walk along the curved walls of the castle to find room after room of different functions. This was a proper fortress, so there were gaps on the walls for people to shoot at any potential enemies. There was also a torture cell where they dropped people down about 3 floors underground in a dark dungeon. At the end of the tour is a very grand ballroom! But like most preserved castles, photos aren't allowed inside. I guess you'll have to go and find out what it looks like yourself! A little bit about Rothenburg: it is the oldest town in Germany, originally founded by the romans before year 1,000. It was preserved throughout many wars because it wasn't wealthy town and so was not considered as a military target. Most people would know that Walt Disney traveled to Neuschwanstein castle which inspired his design for the sleeping beauty castle. 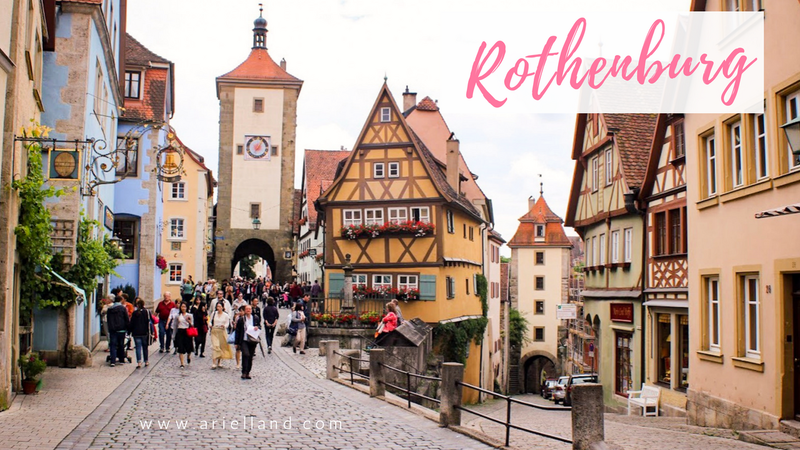 In the little Medieval town of Rothenburg, Walt Disney was inspired by the architecture which is later incorporated to the film Pinocchio. Harry Potter and the Deathly Hallows also took some shots from this little town. Before we were let off the bus, our guide handed each of us the map of the town. I had raided on google maps on where to take the best photos as this is truly an instagram/pinterest dream travel destination. The group is a massive group and took a long time walking through the parking lot and to the city, so we went ahead and ran into the town first before the big group crowds the pictures. I wish I could've stayed overnight so I could wake up in the early morning when the town is still empty. However it's a bit difficult to travel through Germany's little towns without a car. So unfortunately, we're stuck with this tour group for now. (Above) the classic view you see everywhere online of Rothenburg! "Liebe muss nicht perfekt sein, sondern echt." Love doesn't need to be perfect, only real. It's really difficult to put Rothenburg into words, photos are the best way to show you how beautiful this town is. I wished that we had more time, but it was very short including lunch time so we had to rush through. Maybe in the future when I return again to Germany, I'll rent a car for another trip!